Get your children to grow their own vegetables. It is amazing how this can inspire them actually eat their greens. 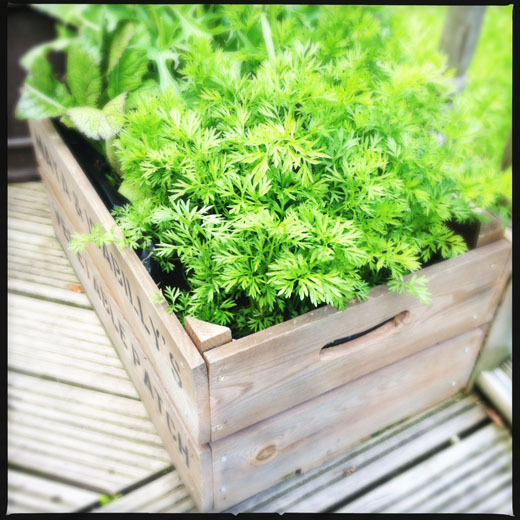 In mid spring or during early summer, get a wooden vegetable box from your local market or green grocer. From your local garden centre get a medium sized bag of compost that’s a similar size to the box. Cut open the bag along the long edge and drop carefully into the wooden vegetable box. Using a knife, cut the bag til it is opened out fully and fits the wooden box. If you have too much soil, remove and put somewhere to be used again. Roll down the edge of the compost bag so it all fits snugly into the box. Using the knife again, cut small incisions into the bottom of the compost bag so water can drain out. Place the box onto a couple of pieces of wood, so it is slightly raised and the air can get around it. Plant vegetable seeds or seedlings – we recommend carrots, salad onions and lettuce for your first attempt as these are easy to grow. Plant them in small rows. Make sure the box is well watered, and check to make sure they are not over crowding. If it is getting a bit tight with too much growth, thin them out by removing a few plants. Keep checking them to see if anything is ready for harvesting. The carrots will take the longest, but the lettuce and onions should be ready after just a few weeks.